Next Thursday, the Google Pixel 3 and Pixel 3 XL will be released, and hopefully the pair won't have the early problems that had some Pixel 2 and Pixel 2 XL owners discussing a class action suit against Google, LG and HTC. Some smart consumers like to wait for the the next generation model of a phone to launch because that means big savings as carriers and retailers cut prices in order to clear the warehouse of the now "dated" model. Case in point, the 64GB Pixel 2 XL. With the Pixel 3 XL coming next week, Best Buy has dropped the price of the 2017 model by $300. 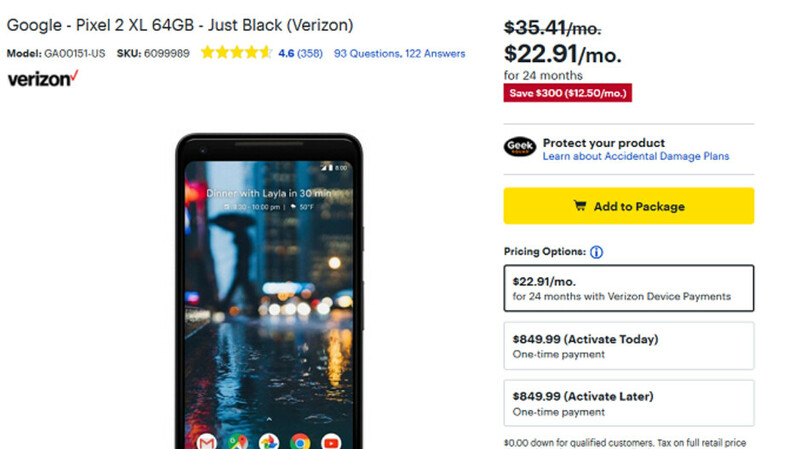 This is the Verizon branded variant of the phone, and the discount comes to play only if you agree to buy the handset using Verizon's 24-month payment plan. Instead of the 24 monthly payments of $35.41 that you might have paid a few weeks ago, the $300 discount takes the 24 monthly payments down to $22.91; the 128GB version will set you back just $29.13 a month over 24 months. The beauty of saving some money with the Pixel 2 XL is that many of the new features coming to the new model, such as Call Screen, AI feature Playground, Duplex and Night Sight for pictures taken in low light, are all coming to the Pixel 2 XL over the next few weeks. If interested in picking up the Pixel 2 XL and helping Best Buy empty its warehouse, click on the sourcelink below. Would it kill them to just discount the phone outright instead of always having to hook people into a payment plan. Payment make payment seem affordable and more attractive. which one will get you more attention, the phone only go for $500 or the phone only go for 16.67 a month? But why force people into a payment plan when people like me would just want to buy the phone and be done with it. This has been the sale on this phone for months now nothing has changed!